No joke: Nobody has cast a more immense shadow over Miami hip-hop over the last decade than Khaled bin Abdul Khaled. In his dual capacity as rapacious radio personality (for local hip-hop station 99 Jamz) and the world's most exuberant compilation album curator, the New Orleans-raised jock has become Dade County rap's central axis, a position he's used to assemble ever more massive posse cuts. Although Khaled has put together more prestigious guest lists since, "I'm So Hood" (from 2007's We The Best) still stands as one of his biggest block anthems. Tapping what were probably Florida's three biggest MCs at the time in Rick Ross, Trick Daddy, and Plies, as well as it's No. 1 rapper-turned-sanga in T-Pain, Khaled turned the Gunshine State quartet loose on a buzzy beat from "Hustlin'" producers the Runners. 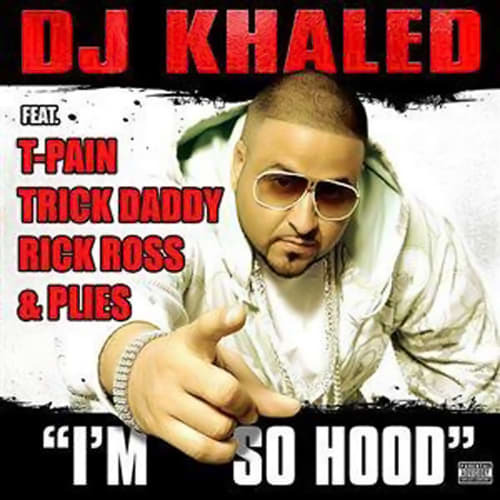 A street single in spirit, "I'm So Hood" was actually Khaled's highest charting single until the much more commercial-friendly "I'm On One" surpassed it this summer.